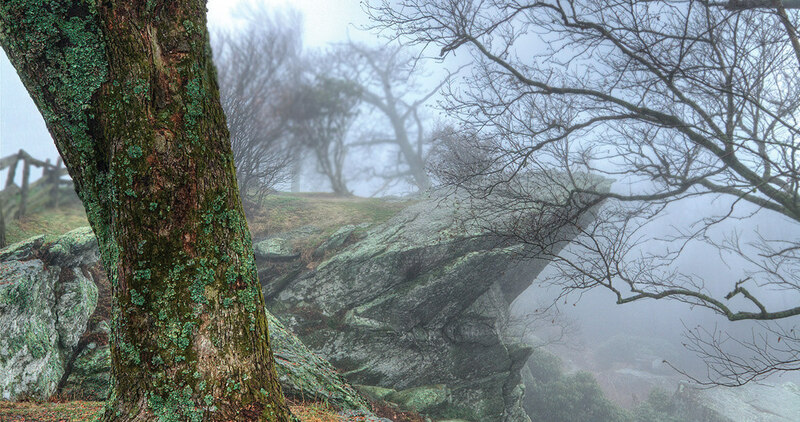 Rocks and ridges help decode mysteries hidden in our woods. Most of the time, it’s a rocking motion under my boots that gives me pause, an undulation, like I’m walking on the crests of an easy-going ocean. That’s when I notice them. In harsh light, they can be difficult to see. But early and late in the day, when shadows pool in the bottoms of those old, forgotten furrows, they are as plain as day. They are the remnants of some tenant farmer’s back 40 acres of corn, or some homesteader’s patch of long-gone beans or cotton or tobacco, now grown up in soaring pines and oaks and gums. Once you know what to look for, you find these ghosts in woods all over the place. December’s woods are spare and brown, but they’re hardly barren. This is the season of unveiling, of trees gone bare, and shrubs and vines defrocked. Winter reveals the past lives of a landscape like no other season. Outside of the Smokies, nearly every North Carolina forest, woodlot, and patch of big oaks has been timbered, plowed, grazed, grown over, cut, forgotten, and grown up, time and time and sometimes time again. Old fields turn to grassy meadows, meadows to pines, pines to gnarly mixed woods of shortleaf and maple, all maturing to hardwoods of oak and beech and hickory. It doesn’t take a trained eye to pick up some of the clues to old farmsteads of decades gone by. Solitary chimneys stand like cemetery markers, enduring monuments to homesteads swallowed by fire or rot. Stone walls might mark an old pasture, or a roadbed, or a plot of family graves unvisited other than by birds and deer. But those are the obvious traces. Others require a closer look. Consider the common rock pile. They’re everywhere: knee-high to waist-high mounds of rocks that punctuate the somber landscape with glints of quartz and mica. You might not give them a second thought, but other folks recall them with a groan, remembering how they helped clear the family’s fields, digging stones out of dirt and clay to pile them out of the way of the plow. In Umstead State Park, you can see a dozen piles during an hour’s hike. In the Uwharrie Mountains, the piles are favorite haunts of timber rattlesnakes drawn to the heat of sun-drenched cairns of quartz. Once you see a rock pile in this new light, you might discover more clues to the inhabitants of your favorite woods. A deep, dry gully is likely the remnant of some steep, eroded field ditch. Follow it uphill, and you might find a homestead oak. In an open farmstead yard, oak trees spread branches out on all sides, low to the ground, and they’re easy to spot in younger, tangled woods. Cedars growing in a straight line are a can’t-miss clue: The birds that sat on a long-vanished fence dropped cedar seeds in their scats. Up came the conifers, straight as a split log. A stand of multiflora rose could mark an old vegetable garden hedgerow. Look carefully at the base of big trees for the glint of an old Mason jar, or the shard of a broken dinner plate brought up from the soil like a shell tumbled to the beach. If you’re lucky, you might find a rusty strand of barbed wire enveloped in tree bark. If you’re very good, you could stumble upon a cat-face pine — an ancient longleaf pine bearing the whisker-like scars of a tree once slashed by an old turpentiner mining its pitchy resins. Walking the woods, I sense the ground pitch and swell, and I know it in my bones: Someone worked a mule through here. Someone built a cabin. In the quiet, I imagine the creak of a leather trace, the clink of a dinner plate, the sigh of a man whose hard day in the fields will mark the land long after he’s gone.